-Where is this car currently displayed? Laurel and Hardy used mainly Model T Ford's in their films . Films such as 'Perfect Day ' , ' Hog Wild ' ,'Towed in a hole ' and 'Big Business ' , their car usually came out ready for the scrap heap .From James Finlayson's single handed destruction of their Christmas tree carrying car in ' Big Business to their crash into a tram in 'County Hospital '. In part, the Model T's popularity on the big screen comes because the car and the medium emerged at approximately the same time 100 years ago – and both became very popular almost overnight. "The Model T was the 'it' car of the 1920s. It was the best selling vehicle at the time. and everyone in Hollywood and beyond wanted one." said Alessandro Uzielli, head of Ford's Brand Entertainment division. As the first moviemakers moved beyond static interior shots to the outdoors, it was only natural to capture the motion and movement created by the car. In that way, Hollywood reflected the changes brought on by the automobile and mass migration to cities. 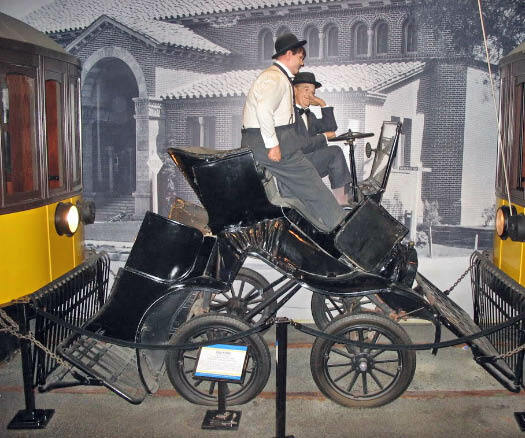 While the Model T appears in the short films of such early Hollywood comedians as Keaton and Lloyd, it was the laugh-out-loud lunacy of Stan Laurel and Oliver Hardy that made the Model T a featured player. In one of the last and funniest silent-era films, "Big Business," (1929) Laurel and Hardy are selling Christmas trees out of the back of a Model T truck. When a cranky neighbor rejects their pitch and the tree is damaged, the pair takes it out on the man's house as he inflicts reciprocal destruction on their vehicle. A "Perfect Day," (1929) Laurel and Hardy's third talkie, features several gags on-board a Model T. When Ollie asks Stan to "throw out the clutch," he reaches down and does just that. In the end, the car drives into a puddle that swallows the pair, their passengers and the car. In "Hog Wild," (1930) Hardy climbs a ladder mounted on Laurel's Model T to install a radio antenna and Laurel accidentally drives off with Hardy still clinging to the ladder. In the finale, the car gets crushed between two streetcars like an accordion – and ironically, seems to run better for it. Another gimmick Model T was used in the duo's 1928 silent hit, "Two Tars." 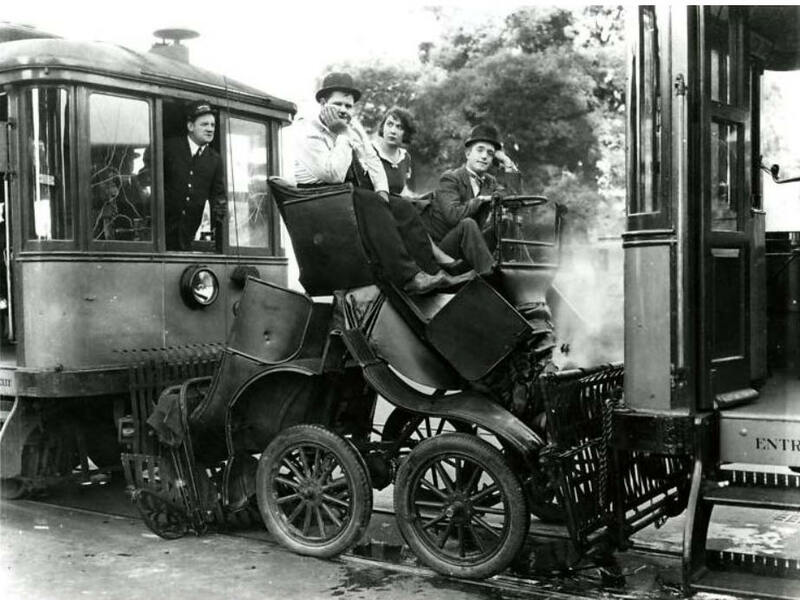 In that short film, Laurel and Hardy create havoc in a traffic jam and then escape in their Model T into a railroad tunnel. The resulting unseen collision with a train causes them to emerge in a roadster that's been squashed sideways – but still runs, of course. Congrats to Ariejan Bos, Frank Scotty, Greg Oriero, Tim and Art Kleiner for correctly answering all three Mystery Foto question. Kudos to Frank Femenias, Steve Lucas ("1920's") and Hugh Nutting (1923/1923) for correctly identifying the manufacturer, model and current location. A high five to Rich for identifying the car and current location. A high four to Walter McCarthy and Jon Reynolds for correctly answering the manufacturer and model #. A 18:22 version of Hog Wild. The Ford Model T appears in the following segments: 4:00, 5:16, 15:00 (excellent stunt driving! ), and 17:00 (funny crash ending). The opening scene remains me of Jackie Gleason's Honeymooners televison shows. Another image from Hog Wild submitted by Frank Femenias. The crushed Model T exhibilt or a replica of the Hog Wild car on exhibit at the Petersen Automotive Museum in Los Angeles. Nice mystery, because it made me look again at the beautiful ‘slow comedy’ of Laurel and Hardy. The car is Laurel & Hardy’s favourite model T Ford (what else!? ), the movie ‘Hog Wild’ (with previously unseen detail: the chimney bricks floating in the pond ...) of 1930. Production of the T-Ford already had stopped of course, but there must have been present everywhere still an overwhelming amount of Flivvers for all kinds of purposes, including the numerous Ford-acts in the Laurel & Hardy movies. Determination of the production year of the car itself is not easy for me as the 20’s are not really my thing, but I’ll give it a try. After some research I would guess on the basis of several details, that it is an early ‘20s model, probably 1921 or 1922. The movie car resides presently in the Petersen Automotive Museum in LA. After studying the ‘Hog Wild’ Ford at the Petersen Museum, I must conclude that there are many (small) differences between this car and the car in the movie. One remarkable difference is the windshield frame, which obviously belongs to a younger Ford. So this makes me really doubt if this is the original or a later produced copy?? it is a 1922 Ford model T touring from the film “Hog Wild” and is in the Petersen Museum in Los Angeles. A 1922 Ford Model T from ‘Hog WIld’ (1930) now on display at the Petersen Museum in Los Angeles. This is a scene from the finale of the 1930 two-reel Laurel & Hardy film entitled “Hog Wild”. It’s a Model-T Ford, probably from the early 1920’s, that I believe is currently at the Petersen Museum in Los Angeles. For extra credit: name the actress in the back seat. This was in a Hal Roach/MGM film, “Hog Wild” which came out on May 31, 1930. It is a 1923/24 Model T Ford touring car. A display prop copy is at the Petersen Museum in LA. There are few other original studio photos of this, too. It’s a Model T Ford all crunched up! The crushed automobile is a Model T Ford touring. With the straight windshield the year might be a 1919-1920-1921. “Hilarious picture! Hadn’t a clue but the search on this one was easy. From the 1930 movie Hog Wild, they managed to nicely crunch what looks like a mini version of a Ford Model T? (the wheels are too small). Model T’s were often used in Laurel and Hardy movies. The car is on display in the Petersen Museum in Los Angeles. Check out the pictures. Cheers.